The Amsterdam-based DNK website’s audio section, dnk-amsterdam.com, has uploaded a live recording by Vesna Pisarovic (voice) and Roberto Garréton (electronics) from May 2007. Pisarovic has a gentle sound, at least to the extent that it’s legible as a voice in this recording. For the most of the piece, Garréton’s electronics send the voice through an exhausting exercise course of techniques, from waifish chorale to spectral whisps to data chatter (MP3). The retro-ASCII design at the DNK MP3 page was headed up by media artist André AvelÃ£s. … This is, by the way, the final Disquiet.com Downstream entry of 2007. Happy New Year, everyone! Cut to the chase, the clock’s ticking on 2007 as I type this. That previous sentence is intended to provide an alibi: making note of the circumstances under which a “best of” list is produced gives me an out down the road, when I might change my mind. In any case, this year’s “best of” is, in fact, four separate lists. How’s that for a hedge? Part 1/4 is of “commercial full-lengths,” what we usually call “records” or “albums,” which are reportedly a dying species though I feel like there were more released in 2007 than ever before. Part 2/4 is a list of five key reissues. Part 3/4 is a list of my favorite 10 freely, legally downloadable MP3s (and MP3 albums — and, in one case, an OGG file). Finally, part 4/4 is a list of 10 “key people,” and they’re really less individuals than individuals who stand for — and, in one case, stand apart from — trends in technologically mediated and otherwise ambient contemporary music. That sums it up. Oh, just one more thing — some of the best music I heard this year came on a CD stuck inside the back of a book, including Robert Scotto’s Moondog biography (with tracks featuring Steve Reich and Philip Glass, among others), the anthology Radio Territories (with tracks by Kode9 and Disinformation, among others), and Alan Licht’s Sound Art: Beyond Music, Beyond Categories (with tracks by Bill Fontana and Bernhard Gal, among others). But four lists were enough — probably more than enough. Part 1/4 — BEST COMMERCIAL FULL-LENGTHS: They appear here in alphabetical order, as an iPod would alphabetize them. 1. 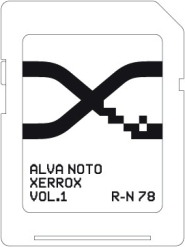 Alva Noto Xerrox Vol. 1 (Raster-Noton) Alva Noto is Carsten Nicolai, who is as much a sound designer as he is a musician, and as much an installation artist as he is a performing or recording one. This album works as a pair with Cue, the Andrew Pekler release also on this year-end list, in that both take as their source material the un-music that fills the background of our public and private lives. In Nicolai’s case that means “samples from Muzak, advertising, soundtracks and entertainment programs,” though the end result is entirely his own — background, yes, rendered as a variety of drones and textures that you’ll welcome into your home as you might custom wallpaper or an evening breeze. It’s promised to be the first in a series of five. It’s available not only as a CD, vinyl LP, and digital download, but as an SD memory card (the latter pictured at left). How’s that for modern living? 2. 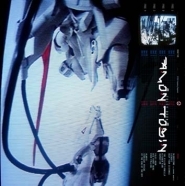 Amon Tobin The Foley Room (Ninja Tune) It’s not that music is becoming conceptual art, necessarily, but concepts play a stronger and stronger role in recorded music with each passing year, especially in electronic music. Perhaps such concepts simply provide useful, self-imposed constraints, which are welcomed as technological progress increasingly frees musicians from previously existing constraints. Whatever the cause, the concept at the heart of Tobin’s Foley Room is to work from real-world samples, like the Kronos Quartet snippets from which “Bloodstone” is stitched together and the motorcycle that fuels “Esther’s.” The result has all the drive, all the “post-drum’n’bass” momentum, one expects from Tobin. 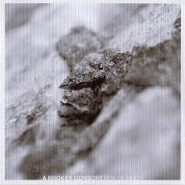 A pre-release single of “Bloodstone” included a track titled “Here Comes the Moon Man” that’s the closest Tobin has come to indie-rock, with utensil percussion and a mournful bass line; its interesting narrative structure, from that bass line to something more ethereal, is no doubt attributable to its role as part of the soundtrack to the film Taxedermia. A subsequent single collected remixes of “Kitchen Sink,” the original built from globs of water and masterfully elastic efforts in pause and release; the remixes are by Clark, Sixtoo, Noisia and Boxcutter. 3. 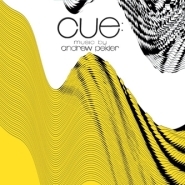 Andrew Pekler Cue (Kranky) Andrew Pekler reportedly constructed Cue, as the name may suggest, from library music — that is, from music bought and sold by the yard for commercial use, music made and heard anonymously, invisibly. What he’s made from it is an endlessly listenable post-rock album of tidy little grooves, pop-minimalist counterpoint, everyday exotica, and warbly turntablism (or at least, on a warped track titled “Dust Mite,” what sounds like avant-garde turntablism, all loopy and drowsy). Like all good background music, it works well in the foreground — and vice-versa. … Also: Along with the Alva Noto album Xerrox (listed above), the 2007 album Lifestyle Marketing by Thes One (aka Christopher Portugal, of the group People Under the Stairs) explores similar territory and is also worth checking out; the double album includes advertising and other background music by Herb Pilhofer on one CD (or LP) and, on the other, music that Thes One built from those themes, leaving much of their source material intact but updating the beats and the feel and enjoying a bit of a goof tweaking the original’s commercial intent. 4. 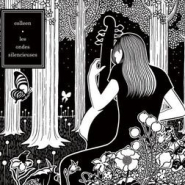 Broken Consort Box of Birch (Sustain-Release) Recommending anything released in a strict limited edition kinda goes against my politics, my prejudices, and my general sensibilities. But Box of Birch, along with other releases by British artist Richard Skelton, who records under several names, including Broken Consort, helped me realize that this sort of hand-crafted package in any other artistic realm — artists books, photography, and sculpture — wouldn’t raise an eyebrow; it would simply draw praise for its attention to detail and to the overall care that went into its production. And that each Sustain-Release release comes with an implicit promise of a more cost-efficient edition down the road helps. But enough about the box, what about the birch? The four tracks here are glistening, rumbling layers of seemingly infinite acoustic instrumentation; the album persistently explores the ecstatic space between melody and drone, absolutely beautiful stuff that brings to mind the Boxhead Ensemble (mentioned in previous Disquiet.com year-end best-of’s), Colleen (mentioned directly below), and John Fahey (a father figure to this sort of thing). For further reading, there’s an excellent interview with Skelton at digitalisindustries.com. 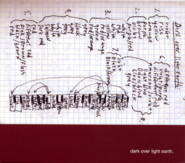 … Also: A very close runner-up was the new recording of Gavin Bryars‘s dark, claustrophobic sound-work The Sinking of the Titanic, featuring Bryars on bass, Philip Jeck on turntables, and the ensemble Alter Ego, whose instrumentation ranges from bass, viola and clarinet to bottles, tape recorder and sound design. It was released on Touch, a record label synonymous with elegant packaging and limited editions, but this set looks downright utilitarian compared with Skelton’s. The music is tremendous — a deeply felt rendition of a work, originally composed in 1969, that deserves to be as central to the minimalist canon as is Terry Riley’s In C, which was composed five years prior. I’d love to hear what Kronos, Alarm Will Sound and the Warp roster, for that matter, would do with this composition, which needs no further description than its title. 5. Colleen Les Ondes Silencieues (Leaf) Two years ago I included in my top 10 an album, also on the Leaf label, by Colleen (aka Cécile Schott) built from guitar, 19th-century glass harmonicon, and glass glockenspiel, all of those instruments manipulated in one way or another. This time around the materials are no less analog, but the sound maintains considerably more fidelity to their natural state: viola de gamba, spinet (a harpsichord predecessor), and clarinet. Heard from a separate room, this might be mistaken for courtly music of another century, but on repeated listens the melodies take a back seat to texture and tone. On “Le Labyrinthe,” it’s how each plucked spinet note supplants its predecessor that’s at the heart of the listening experience, a kind of cascade that goes up and down. On “Blue Sands,” it’s how the viola de gamba can work itself into a hypnotic, loop-like reverie. And on “Sea of Tranquility” it’s how the clarinet can alternate between the visceral quality of its player’s embouchure to the enveloping warmth of its held tones. 6. 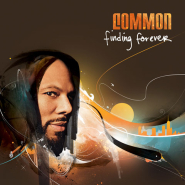 Common Finding Forever (Geffen) I don’t wish the future to arrive too quickly, but we will look back, some day, at the collaborations between producer Kanye West and rapper Common as a remarkable union. Today, most rap albums are collections of songs that were composed in isolation by producers, purchased like bespoke luxury goods by hit-hungry rappers after the fact, and then given vocals with more of an eye than an ear toward maximizing chart positioning. A single rap album can have more production credits than it has tracks. That’s not a criticism, just an observation; heck, most of the 12″s I buy are the end product of the well-oiled (if economically jittery of late) rap-industrial complex. What’s essential about the West-Common union (and excuse me for putting West’s name first, but the fact of the matter is that this is a lovingly produced album and it’s only standard industry practice that keeps him from getting co-billing, let alone top billing) isn’t just that West has Common’s smooth, earnest delivery in mind when he makes these backing tracks, but that the albums — this one and last year’s Be — are singular listening experiences, helmed (almost entirely) by one individual from start to finish. West knows that nostalgic grooves, percussionist flair, and extended instrumental breaks are the perfect setting for Common’s voice. And a guest cameo by one of hip-hop’s greatest producers, DJ Premier — albeit at the turntables, not the mixing deck — on “The Game” just tops it all off. As always, West’s productions (he did all but a small handful of the tracks) are eminently enjoyable on their own — if you can locate ’em, just try the martial beat of “Drivin’ Me Wild,” shorn of Common and guest Lily Allen, or the hypnotic lounge music of the instrumental edit of “Start the Show,” with its hoarse flute and off-kilter loops and fades. 7. 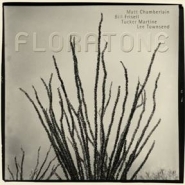 Floratone Floratone (Blue Note) Floratone is a four-man group: guitarist Bill Frisell, drummer Matt Chamberlain, and producers Tucker Martine and Lee Townsend. Together they’ve quadrangulated a musical space where groove and atmosphere are one, from the opening dub of the title track to the slow-burn drive of the appropriately titled closing track, “Threadbare.” It’s a strong follow-up to a similarly studio-hewn Frisell record, 2004’s Unspeakable, and it is in the tradition of such material as the 1994 Los Lobos/Mitchell Froom/Tchad Blake collaboration Latin Playboys and, of late, the more outward-bound work of Galactic and Medeski Martin & Wood. 8. 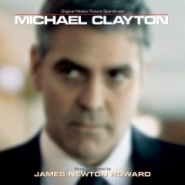 James Newton Howard Michael Clayton (soundtrack) (Varese Sarabande) Don’t let the heightened pulse toward the end of the “Main Titles” of James Newton Howard’s score to the film Michael Clayton fool you. This is an album, much like it was a movie, of sublimated anxiety. Both are virtually thrill-less thrillers that thrive on subtle tension, existential longing, and occasional respite. 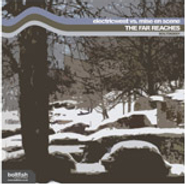 Where the movie explored the back rooms and moral logic of corporations, the score explores the mechanisms of mood, from the dappled clank of “Drive to the Field,” to the economic mallet work of “Arthur and Henry,” to the rising drone of “Horses.” If this had been released on the Chain Reaction record label or played by, say, Plastikman or Monolake during a DJ set, no one would blink an eye — they’d just nod their heads and applaud its atmospheric achievement. 9. Madlib Beat Konducta Vol. 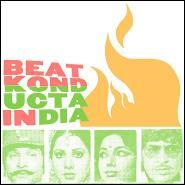 3-4: Beat Konducta in India (Stones Throw) How can you not love an album of would-be hip-hop instrumentals built from Bollywood samples that opens with a track titled “Enter: Hot Curry”? Madlib is so prolific he’s less a person than an algorithm; in this case he takes the hyperbolic sounds of Indian films, locates beat-ready nuggets, and cuts them to suit. The best track, or at least my favorite, “Indian Deli,” could be a lost Neptunes jam, or an ancient recording of a Talking Heads concert on some forgotten Indian leg of their Remain in Light tour. 10. Steve Roden Dark Light Over Earth (New Plastic Music) A musician who works with some of the most infinitesimal sound sources imaginable, Steve Roden was the perfect choice to provide sound for an exhibit at MOCA in Los Angeles of paintings by Mark Rothko, whose naked color fields are some of the most monolithic yet minimalist, epic yet personal, paintings of the 20th century. Rothko is also bonded by name to the composer Morton Feldman, whose interest in silence and simplicity is the foundation for his Rothko Chapel, as well as for much of what we think of today as “lowercase,” “microsonic” or otherwise hyper-minimalist music. Roden’s recording, with its emphasis on quietude and its introduction of violin, played by Jacob Danziger, is a half-hour distillation of his highly process-driven compositional strategies at their most effective. Part 2/4 — BEST REISSUES OF 2007: In the past, I haven’t singled out reissues at year’s end, but since the poll at idolator.com included a reissues section (I participated, as well, in the villagevoice.com poll), I gave it some thought and selected the following five, based even more specifically on my own listening than on some sort of even vaguely semi-comprehensive look at the field. A true reissue fever occurred during the first decade following the introduction of the CD, and though that initial surge of activity has faded, it has given way to a deeper second (or third?) wave that’s unearthing many more unusual and elemental recordings. Only one of the following five, the Miles Davis, was released prior to the 1982 commercial introduction of the compact disc. In defense of Nonesuch, which originally released the Scott Johnson score to Patty Hearst, it’s fairly common for soundtracks to go out of print not long after a film’s theatrical run comes to an end. Also in Nonesuch’s defense, that label this year picked up for reissue an album, Laurie Anderson’s Big Science, that Warner Bros. had let languish. And this being a small world, the music collected on the Miles Davis box set mentioned below marks the end of Davis’s career at Columbia before he moved to Warner Bros.
1. Scott Johnson Patty Hearst (soundtrack) (Tzadik; originally Nonesuch, 1988) This score to the under-appreciated Paul Schrader film about an American celebrity-terrorist (played by Natasha Richardson) was one of several key moments at which the American film industry took full advantage of the downtown music scene in Manhattan (other examples include Jim Jarmusch’s use in Stranger Than Paradise of John Lurie, who also starred; John’s brother Evan’s work on Trees Lounge, Joe Gould’s Secret and many other films; and countless Philip Glass scores). As is characteristic for Johnson, the Hearst score takes spoken phrases, in this instance from the film itself, and mines them for their interior melodic content; the melodies inherent in what is spoken then become the basis for the music, whose instrumentation includes Johnson on electric guitar and Michael Riesman, longtime music director of the Philip Glass Ensemble, on keyboards. Schrader, by the way, has incredible taste in music, up there with Michael Mann’s. Glass scored his Mishima: A Life in Four Chapters, released three years prior to Hearst; Thomas Newman did some of his earliest professional work on 1987’s Light of Day; Angelo Badalamenti scored Comfort of Strangers, which followed Hearst; and Anne Dudley, of the group Art of Noise, did Schrader’s most recent, this year’s The Walker. 2. Miles Davis The Complete On the Corner Sessions (Columbia; originally Columbia, 1972-1975) The closing period of Miles’s so-called electric era — leading up to the hiatus that preceded his move from Columbia Record to Warner Bros. — gets boxed. (What does that make his Warner Bros. period? The “pop” era?) Includes a dozen previously unreleased tracks. 3. Christina Kubisch Night Flights (Important; originally ADN, 1987) Collages by a path-breaking sound artist. 4. Pauline Oliveros Accordion and Voice (Important; originally Lovely Music, 1982) Meditative recordings by the American maverick. Part 3/4 — UP WITH THE DOWNLOAD: As I’ve done for the past few years, I am singling out 10 free, legal downloads as my favorites of the year. These are all selected from the nearly 170 entries posted on Disquiet.com in its Downstream department during the course of the past year. To constrain the field, to make it knowable, this list is limited to recordings that are “of the web.”The following were not considered for inclusion: promotional tracks posted from existing or forthcoming commercial albums (that goes for individual tracks or excerpts — special “mixes” were considered for inclusion, such as Prefuse 73’s “self-mashup” [disquiet.com], though none made the cut), downloads that were placed online for a stated limited period of time (like Monolake’s generous “download of the month” series at monolake.de), audio that is streaming-only (such as the work sponsored by the Tate Museum at tatetracks.org.uk), and dated archival material (such as the majority of what is housed at ubu.com and in the Other Minds catalog at archive.org). Also not considered for inclusion were tracks whose links have subsequently gone offline (like si-cut.db’s excellent remix of Jem Finer’s “Longplayer” [disquiet.com]). All of which is to say, everything on this list is of recent vintage and is available to download, for free, right now. Click through to each original Downstream entry for more information. The 10 are listed here in the chronological order in which they appeared on Disquiet.com. Given the fluid nature of publication, attribution, and collation on the Internet, I cannot be certain that these audio files first appeared online in 2007, but most if not all of them did. And if some of them are older than that, at least this mention might gain them a new audience. There are 16 minutes of music in the film, almost 6 of which are in the end titles. Part 4/4 — KEY PEOPLE IN 2007: Usually I close my year-end lists with a mini-essay on themes and, for lack of a less inherently offensive term, “trends” that I hadn’t managed to touch on in my descriptions of the recordings I’d singled out. This year, that essay is given form thanks to the poll at idolator.com, which called for participants to list five key “things” from 2007 — which, the instructions read, “means anything you want it to: musicians, producers, videomakers, biz folk, websites, trends, etc.” In the interest of parallel structure, I limited myself to human beings — and they’re listed, as the explanations below I hope make clear, not so much for their individual (or group) achievements, but for how they serve as leaders in particular realms of cultural activity. Also listed, in most cases, are related other people active in similar areas. And once I began fleshing out the rationale and the categories, 10 proved a more useful field than five. The resulting audio tracks are dreamy, trippy extensions of the familiar, recorded moments stretched to emphasize stereoscopic activity and the waveforms inherent in the sounds themselves. He’s made one track, “Marimba Electronic” (MP3), available for free download as a sample of the full album. Other instruments that serve as source material on Episodes include gong, zither, dulcimer and the instrument with which Downes is most closely associated, the flute — as a veteran of the John Barry Seven, and leader of the group Open Music, whose membership has included Barre Philips (Yoko Ono, Eric Dolphy), Chris Spedding (John Cale, Jerry Harrison) and Kenny Wheeler (Anthony Braxton, Derek Bailey), among others. He also composed music for the mime troupe Mummenschanz. 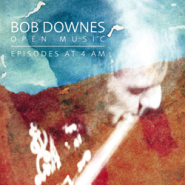 More info on Downes at bobdownesmusic.de. In an exciting development, the record label Boltfish has begun to produce its own netlabel. That is, a “proper” label with some three dozen releases to its credit since 2004 has recently released music intended for free download, and that MP3 is no anomaly; it’s described at the label’s website, boltfish.co.uk, as “the first in an occasional series of free downloads from Boltfish Recordings.” The release in question is a single — a scratchy, glitchy, beaming five-minute collaboration between Electricwest and Mise en Scene, billed as Electricwest vs. Mise en Scene and titled The Far Reaches (MP3). It’s not uncommon for record labels to release promotional MP3s, but spinning off a netlabel is a promising turn of events. The Poland-born musician Bogdan Raczynski fits right in on the Rephlex label — run by musician Aphex Twin — where he’s the house prankster in a house of pranksters. His songs have a brevity and goofiness that makes them stand apart. And his music often includes a tenderness that elevates the work well above mere goofiness. Using simple, Casio-style tones and rudimentary, four-four beats, his records can sound like a throwback, some sorta old-school video-game backing sounds — even when he adds modern-day elements like breakcore beats and jungle madness. But in fact, there’s a lot more melodic development at work than the glimmery surfaces might suggest. This may not count as a prank, per se, but the entirety of his new album, Alright!, which came out in mid-November, is available officially for free download as ZIP file (ZIP) — the catch is, the files are all encoded at 16kbps. That’s in contrast with 128kbps for most commercial MP3s, which is still widely considered relatively poor quality. In an online announcement about the novel promotion, Raczynski describes the 16kbps as “horrendous” and adds: “Please note that these are very lo-fi mp3’s. I don’t want people thinking the actual CD will sound like I’ve filtered my music through a bucket of butter.” Still, it’s one thing to listen to a vocalist or a cellist compressed to 16kbps, and another to listen to music that sounds like it was composed in an era when the plinka-plinka of Pac-Man was state-of-the-art.